The Village Juicery is a local company that provides organic plant-based food and cold pressed juices that are all made in house. 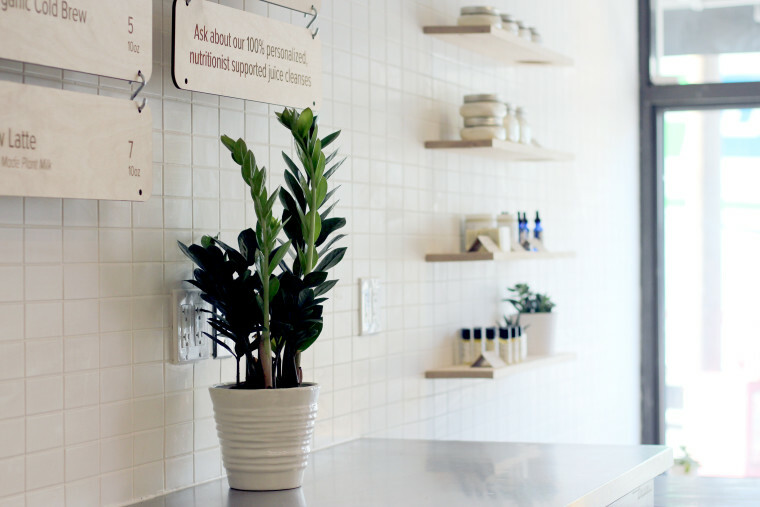 When the owners decided to open their new retail location at Yonge and Eglinton they wanted to create a serene and minimal environment that demonstrated their dedication to wellness. Planning a new business is always an exciting adventure. During the design of their retail locations, done by Toronto design firm MASON Studio, they turned to laser engraving for both their indoor and outdoor signage for an elegant and natural look. This allowed them to use beautiful unfinished woods for everything from their main signage, to bar menus and refrigerator tags. Because of the rapid nature of laser engraving, they were able to test out loads of options before finding the exact look that was right for them. This also allows for flexibility if any product descriptions or pricing needs to be replaced or updated in the future. When you first walk into the new shop the first thing you notice is how calm and relaxed the place feels. The design is so cohesive that the location was recently featured on Azure Magazine for its elegant interior, but the team’s favourite part of opening the new shop is seeing how customers react to their innovative products. 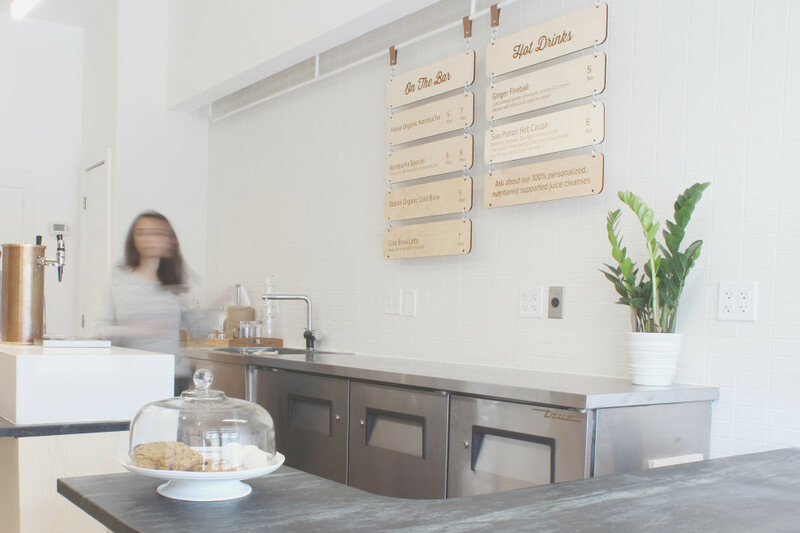 The nutritionist team loves serving up hot superfood elixirs, organic grab-and-go salads and bar specialties like kombucha blends and hot chaga cider. And there’s clearly a desire for it! 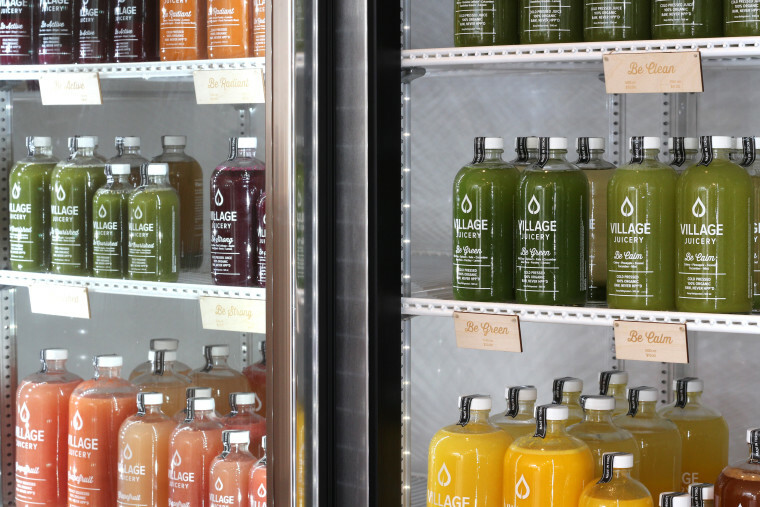 For many neighborhoods in Toronto, even having access to organic, cold pressed juices is an exciting new experience. 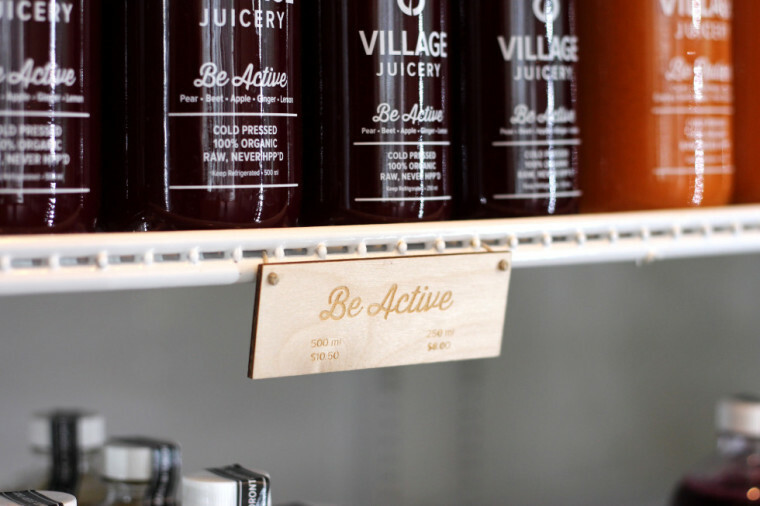 Like many of our clients, Village Juicery is all about supporting the local community. From the local organic farms supplying their produce to the passionate local makers showcased in their stores, and the 50+ small businesses around the city that purvey their products, everything about them is local. Laser engraving is also a great way to support local by using urban wood from Toronto. Nearly 200,000 Toronto trees die of natural causes in a year, and the city saves this material for designers and artists to repurpose. It’s an innovative way to get beautiful designs while using readily available materials. 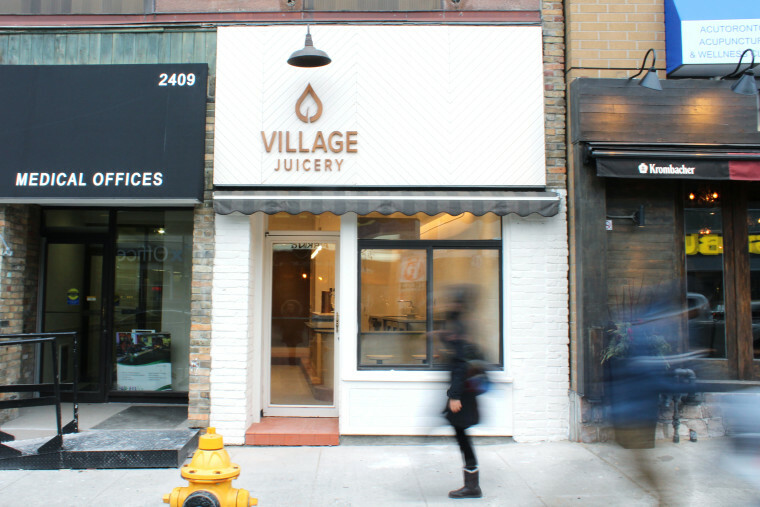 The Village Juicery’s newest shop is now open at 2409 Yonge Street, so if you love good, healthy food, support local and check it out!